A screenshot of Dan Friedell's Devin Vandyke slideshow. One of the good things about working for Patch.com as a freelancer is that the editors are pretty open to experimentation. A few months ago, I did a piece for the Oakton, Va. site about the local high school’s strong girls’ basketball team. We miked up the coach and did a nat-sound audio photo gallery. I decided to try a similar thing with my story about Devin Vandyke, a rising senior at South County Secondary School in Lorton, Va. 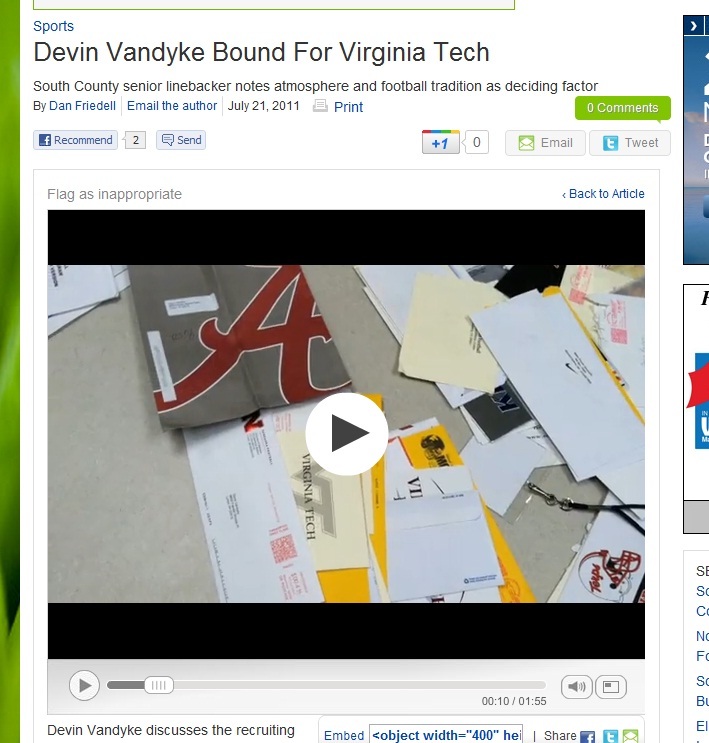 I was writing about the recruiting process for Vandyke, who has decided to play football next year at Virginia Tech. We talked about how he received a fair share of letters, but also lots of contact on Facebook from coaches who were interested in getting on his radar. So I took about 30 photos of his recruiting materials with my iPhone and then asked him to go through some of the items he had received – credentials, yearbooks, hand-written letters, etc. – and tell me what he thought of them. It turned out he was a great narrator. Only one take for the audio. And I think the multimedia project turned out well. Let me know what you think. This entry was posted in Patch.com, Work samples and tagged devin vandyke, imovie, iphone, photo gallery. Bookmark the permalink.